Prototype membranes developed by engineers at The Ohio State University to keep rechargeable batteries from catching fire, and to help them be more efficient. Credit: Pam Frost Gorder, courtesy of The Ohio State University. Researchers have designed a thin plastic membrane that stops rechargeable batteries from discharging when not in use and allows for rapid recharging. The patent-pending technology controls how charge flows inside a battery, and was inspired by how living cell membranes transport proteins in the body. It could find applications in high powered "supercapacitors" for electric cars and even help prevent the kinds of fires that plagued some models of hoverboards recently. In the journal Energy & Environmental Science, the Ohio State University engineers describe the "smart" membrane that they hope will enable the development of a new category of fast-charging and powerful batteries called "redox transistor batteries" for automobiles that will travel farther on a single charge. Put another way, today's very best eco-friendly cars can travel around 200 miles after an 8-hour charge, while gas-powered cars can cover the same distance after only one minute spent at the pump. The researchers hope their new technology can boost electric car batteries to provide up to tens of miles per minute of charge. "That's still an order of magnitude away from the equivalent measure in gasoline, but it's a place to start," said Vishnu-Baba Sundaresan, an assistant professor of mechanical and aerospace engineering at Ohio State and leader of the study. Sundaresan said that today's hybrid and electric cars are hitting the performance limit because of how charge is stored in conventional batteries. 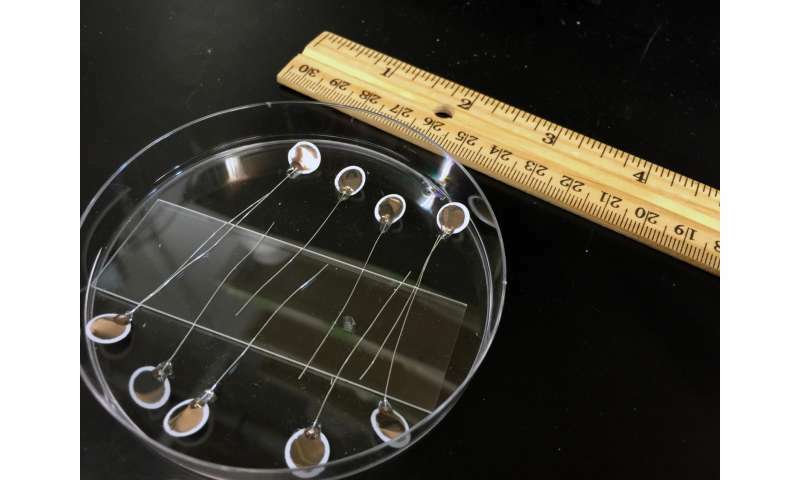 He also believes that his new membrane technology might be the only way to push past that limit until entirely a new category of battery electrodes are developed. "Research over the last 50-plus years has focused on advancing the chemistry of battery electrodes to increase capacity," Sundaresan said. "We've done that, but the increase in capacity has come at the cost of robustness and the ability to rapidly charge and discharge batteries. Electric vehicle design is mature enough now that we know the limit they're reaching is because of the chemistry of lithium-ion batteries." Sundaresan and doctoral student Travis Hery call their invention an "ionic redox transistor," and they're using it to develop a new kind of battery in which energy is stored in a liquid electrolyte—which people can recharge or empty out and refill as they would refill a gas tank. "For everyday commuting, the electrolyte can be simply regenerated by plugging it into a power outlet overnight or while parked at the garage. For long road trips, you could empty out the used electrolyte and refill the battery to get the kind of long driving range we are accustomed to with internal combustion engines," Sundaresan said. "We believe that this flexibility presents a convincing case for weaning our dependence on internal combustion engines for transportation." Batteries such as lithium-ion batteries already have membrane separators that conduct charge and physically separate the anode and the cathode from each other, but even the best of these batteries lose charge over time. That's because membranes can't completely prevent charge from leaking between the anode and cathode, explained doctoral student Travis Hery. The internal chemical reactions are called self-discharge. In the best-case scenario, self-discharge slowly converts some of the battery's internal energy into heat—a gradual power drain. In the worst-case scenario, the leakage causes batteries to overheat and even catch fire, as recently happened with the popular lithium-ion-powered hoverboards and Boeing's environmentally friendly Dreamliner fleet. The design is inspired by cell membranes in the body, which open and close to let cells perform biological functions. Openings in the cell wall respond to the electrical charge of molecules to expand or contract, and it's this principle that the engineers applied to the smart membrane. When the battery is charging or discharging, the conductive polymer shrinks to open the holes. When the battery isn't in use, the polymer swells to close the holes. While the researchers have proven that the membrane works with conventional batteries, what Sundaresan and Hery most want to do is use it as the basis of a new type of battery. They are working to combine a so-called redox flow battery, in which an electrolyte is pumped from the anode to the cathode to generate power, with their smart membrane to create the so-called "redox transistor battery." Self-discharge isn't such a big issue with the current crop of electric cars. Parasitic power use is, because even when the car is off, it's not really off with computers and radios running all the time. The early Tesla S cars had a bug that made them consume nearly 1.4 kW of power when "off", and even with the bug fixed they still drain the batteries in about a month. Ordinary lithium cells hold charge for a year easily. There is less and less excuse for the polluting and noisy ICE.
" the income from battery pack replacements can represent a substantial portion of profit "
How often do you envisage us EV owners changing battery packs? Our old ones are guaranteed full advertised performance for 100,000 miles. "wear up = wear off..."
Keep your old polluter. You will like the slow response, the need for almost constant maintenance, and the noise and stink. We have dodged three oil changes and 450 gallons of gasoline so far. My battery replacement costs are zero. It has a much longer replacement period than your little 12V battery in your polluter. If you do not like clean, cheap, and very responsive performance, stick with the ICE. There will be many ICE mechanics still looking for work. Argue the theory all you want. They are now practical and getting better. The main one being the price of the vehicle, and still for some years. There seem to be plenty of people who enjoy poking holes in the efforts of others, who will never get off their dead asses and actually do anything them selves. "The main one being the price of the vehicle, and still for some years." It depends. Ours is a 2015 model, bought as the 2016 ones came out. We saved $11,500 on that, then got another $10,000 in tax credits. It wound up costing $17,300. No pollution from us, tinitus, we generate our power in the peak, when it displaces the most expensive and polluting sources, and use it at night when it is cheaper, from pollution-controlled baseload sources. No coal,no oil. No, tinitus, you are wrong again. How much manufacturing goes into winding a motor versus casting and carving an engine out of steel? How many moving parts in your ICE? And again, my car is powered by my PV panels and those of my neighbors. The five of us together have about 25kW of PV. And our grid has no coal or oil and is powered by very efficient gas, hydro, wind, utility PV, solar thermal, and other technologies. Well, you know what they say: "Everyone has a purpose - some just as an example to others of how not to be"
"Everyone has a purpose - some just as an example to others of how not to be"
-because they get a sick thrill from composing complex lies and repeating them over and over even when they have been exposed as lies. They will even buy an MS and claim it was something that they earned. People like this need to have holes poked in their efforts. Daily. The reason is they are still new. The ICE has been worked on for over a hundred years. We can hope to see cars being created using more common materials, used in a different way. But it certainly won't be in ten years. We can wait maybe twenty or thirty years for that. It'll certainly happen just for the cost of those materials. Until then, yeah, EV won't easily replace the other cars, even in ten years. That depends on your definition of "replace". For many of us, it has already taken place. But you can wait if you want to support the cost and maintenance of an ICE. As long as buying an EV will ask me to eat only two apples per day for a whole year to make sure i can endure the cost of it, yep, i'll support the cost and maintenance of an ICE. Perhaps in two years, when the 200+ miles cars are out and these are still in good shape, you can get one cheap. My battery replacement costs are zero. You're paying for the short lifespan of the battery one way or the other. The lifespan of the electric car is less than half that of the typical car on the road because the battery ages and wears out within 8-9 years, which means you end up driving half as many miles on the purchase price, which means you're paying double for each mile. Suppose you're driving 40 miles a day 5 days a week on average. You only go through 10k a year. That means by year 10 when the battery is definitely going to be on it's last legs and barely able to hold 40 miles of charge, you've managed 100k miles out of your $35k car, which means 35 cents per mile. Meanwhile a regular car that costs $20k can go through 200k miles in 20 years, and that's 10 cents a mile. You should of course account for maintenance and fuel costs for each car as well, but you'll find out that the ICE comes out on top there as well. They have to be cheap - wouldn't make sense to pay much for a used electric car with a battery that's going to be dead in a couple more years. As for the 200k+ cars - the Tesla Model 3 cost structure is 70% in the battery, and that's for the cheapest option with the smallest battery that won't actually go 200 miles under average conditions. The challenge for Tesla, or any manufacturer for that matter, is how to make the rest of the car for less than $10k and deliver the quality expected of a $35k car. The cheapest ICE cars, such as the Romanian made Dacia Logan, cost about $8k and for that money you get a steering wheel and a seat, and that's pretty much it. Add a 60 kWh battery to it and you're in the same price class as the Model 3. Of course I meant that the ICE car still comes out cheaper overall, not that the maintenance and fuel costs are absolutely lower - unless of course you count battery replacement in as maintenance to get the electric car to work the same number of years. With twice the lifespan and twice the miles to go the ICE car has a huge head-start on the electric car. Some low-maintenance small Japanese car isn't going to cost more than a quarter to a half on top of the purchase price over the lifespan of the vehicle. There are ~250 million passenger vehicles in the US, meanwhile the number of plug-in electric vehicles in the US passed half a million just this may - and that's counting the hybrids and the NEV golf carts as well. That's ~0.2% of the US passenger vehicle fleet and half of them are in California. The overall market share for plug-in electric vehicles is 0.66% and falling. At this pace electric cars won't break the 1% barrier - ever. California is the only place that really sells them, thanks to regulations and subsidies. The rest of the people, save for a few rich enthusiasts, don't actually give a flying f... about electric cars. And the further problem is that if electric cars really start to sell in the millions, there's going to be a supply issue for batteries at around 3-4 million vehicles (1.5% share) because of the manufacturing capacity and supply of lithium. "The rest of the people, save for a few rich enthusiasts, don't actually give a flying f... about electric cars." Yeah, . . they said the same thing about computers. California is coming, Eikka, . . and you can't hide. Pollution control is much easier in large stationary facilities than on each polluting device. Electric transportation allows us to make huge changes in pollution by reducing ICE use and by cleaning up our power generation. Nothing premature about our savings here. Since last December our little e-Golf has saved over 460 gallons of gasoline and several oil/filter changes, running on the power from our PV panels. "The best eco-car makers appear to have hit a performance limit, and that limit is 0.4 miles—less than half a mile of driving—per minute of charging." I don't know where the authors came up with this. Many cars charge much faster than that at a supercharger. My Tesla model S charges at several miles per minute. A full charge takes around 90 minutes, charging to 80% takes around 40 minutes. If I charge at home where I have an 80A charger it takes 5 1/2 hours for me to get a full charge in my 85KWh battery where the charge speed is approximately 54 miles/hour. For those making comments about battery longevity, there already are cars with over 100K miles on them and the current statistics show around 5% loss of range. I'm going on 3 1/2 years and 44K miles and have not noticed any loss of range.